Get your hips shaking and the floor burning! No partner required! This sultry package is perfect for those who really wants to dance and groove! Get ready to discover a fire inside you never knew you had as you shimmy and shake your way through the ultimate dance party. 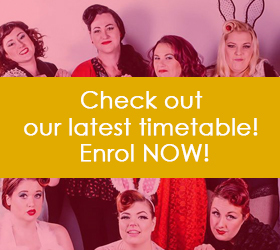 Your professional hens instructor will arrive in full costume to celebrate the big occasion with you, starting with a number of fun warm up games to ensure you and your crowd are limbered up for the main event. No technical skills required! This is all about having fun, feeling good and dancing up a storm. You will learn the latest moves from a number of dance styles such as Latin, Hip Hop, Jive, GoGo, Disco, Mambo, Cha Cha, Samba, Jazz and Funk; as well as the fundamentals of performance and choreography. Your instructor will bring with her a number of dance props for you and your guests to play with and will teach you how to incorporate these into your dances. You will be taught a fun and high energy dance routine incorporating a number of dance styles, and will even have a chance to come up with your own sizzling routine. You won’t be able to wait to show off your new moves to everyone on the dance floor. 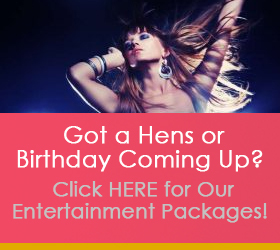 This Entertainment Package comes complete with a Gift Bag filled with dance essentials for the Hen or Birthday Star. Between 14 days and 21 days before your date of function: $100 fee appliesWithin 14 days before your date of function: FULL deposit amount will apply.